With the rise of do-it-yourself, many projects are becoming so cookie-cutter, aren’t they?? I’m more of an unconventional girl, so when I see creative, clever projects, I sort of squeal like a schoolgirl. (It’s the artist in me). I’m a part of RYOBI Nation, which features projects from not just big-time bloggers like Ana White and Shanty 2 Chic, but everyday builders and crafters (basically anyone that loves to create! ), and every month we celebrate a new theme. Well, this month it’s all about workstations! So this month I went on a hunt to find the most creative, clever workstations–everything from spaces to work in your garage, desks, gardening–you name it–anything that’s a place to GTD (get things done). These original, clever projects will surprise (and inspire) you! 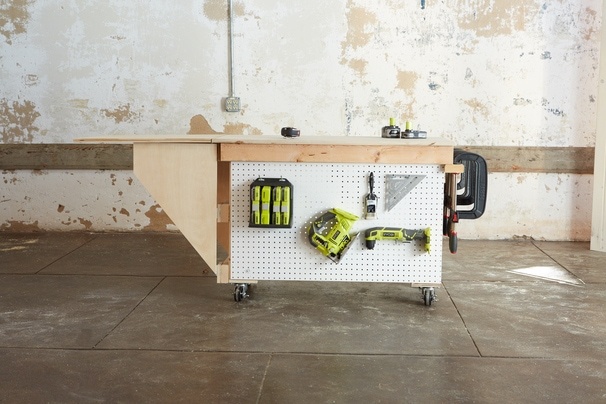 I absolutely adore this “invisible workstation” by Homemade Modern! Not everyone has a large garage space or crafting room to spread out tools and supplies. 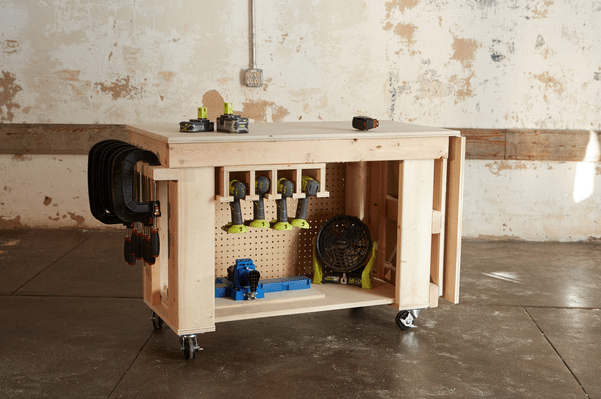 But with this wall-mounted workstation, you now have a space-saving place to store DIY supplies, tools, and cabinet and work table that folds down! And the best part?? He made the bottom of the desk a black chalkboard!! Hello, project reminders!! 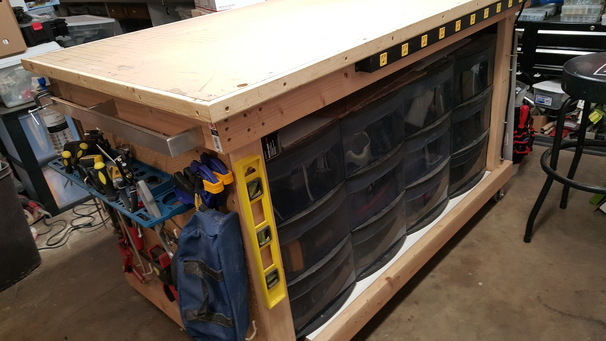 Click here to get the free plans on how to build this invisible workstation! 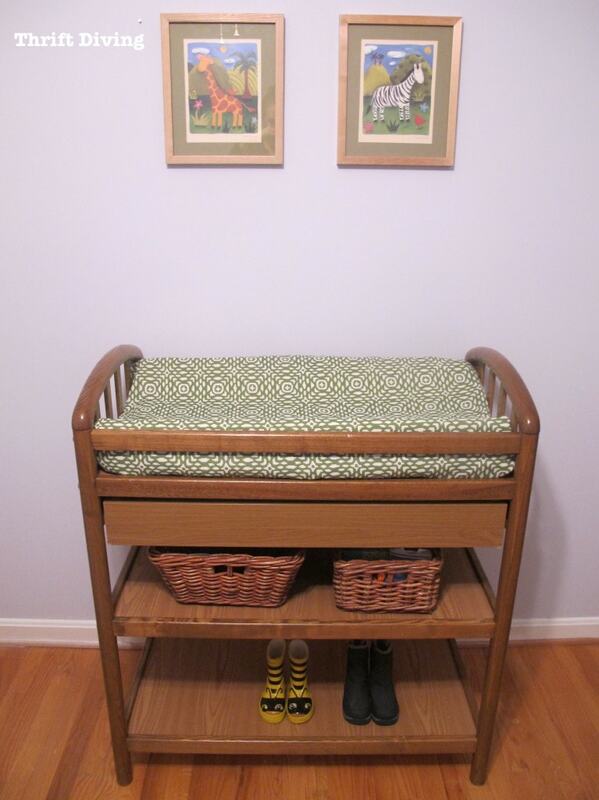 Click here to see the full tutorial of this changing table upcycle here! I have this problem all the time in my workshop: not enough surface space to work!! I love, love, love this workstation by Shanty 2 Chic because it has a top extension with wings for an additional 4-feet of work space. When you’re done, just drop the wing extension and–boom–slide that baby back into some small corner, out of the way! Not to mention there is storage space everywhere! Go download the free plans to build one for yourself! Everyone and their mama has seen that awesome coffee table floating around the ‘net where someone took crates just like this and made a coffee table, right? Well, Crates and Pallets show you how it’s possible to make a desk with these crates, too! All you need are some of these crates from Home Depot, which you can get for about $38 for a pack of 2 or 3, depending on size. Super affordable! Just download the free plans on how to put together your own crate desk HERE! I absolutely love Ana White. I had the pleasure of meeting her a few times at conferences, and she’s the real deal! Her passion for helping people get started with building simple, cute projects is awesome. This gardening workstation is one of my favorites, and I plan to build one as soon as the weather turns nice! What’s clever about it are all the places to store things! You can hang your gloves on the side…hang up towels and tools on the back slats, and even sit things on a little top shelf. Doesn’t get much cuter than this! 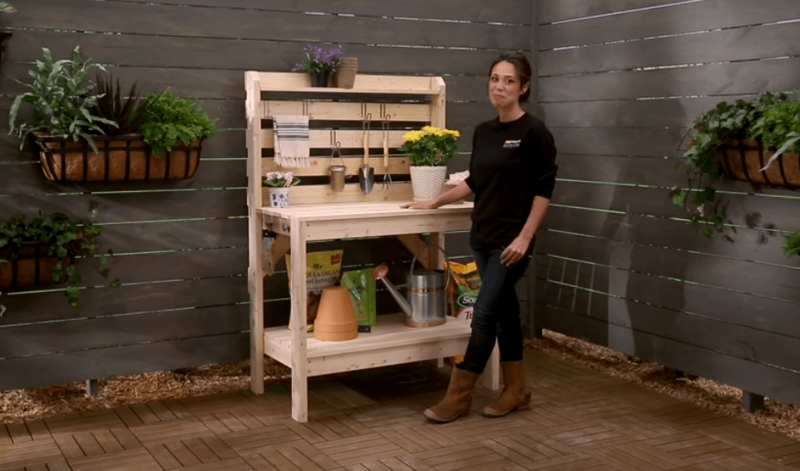 Download her easy-to-follow plans on making your own gardening workstation! This man gets the Clever Builder of the Year Award. Seriously. 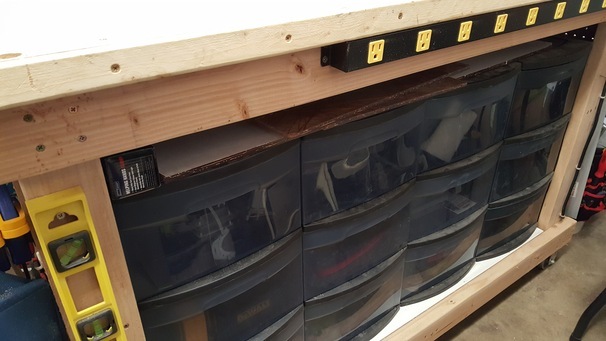 …but he did something super smart: he built the workstation around plastic storage bins so that A) he’d have more storage, and B) he’d save himself a crap-load of time because he doesn’t have to build drawers! Just think of all the cool ways to create your own storage by just building an easy frame around existing storage?? Read this builder’s comments on his project HERE. While this isn’t a workstation in itself, it’s something you could easily make with your crafting workstation: a paint storage shelf! What’s clever about this workstation is that Jeanie from Create and Babble not only customized the shelves to hold her tall spray paints and short sample pots, but she also angled a couple shelves so that her small acrylic paints will be tilted, allowing paint to always be ready to use (instead of having to shake them down until your arm nearly falls off. LOL). Love this! 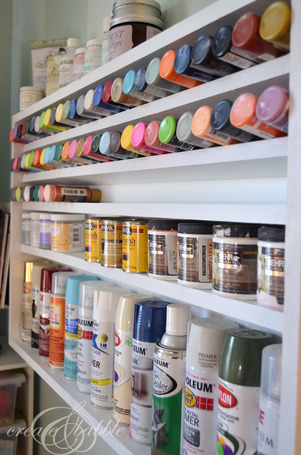 You can get the free plans to build your own paint shelf for your crafting workstation! 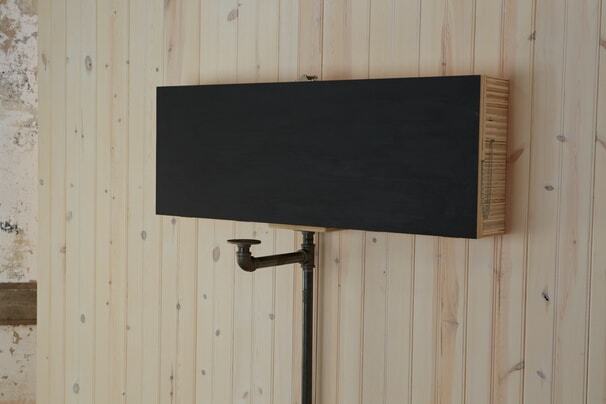 Go ahead…you can say that my upcycled changing table is your favorite. I won’t mind you being impartial. HAHA. All jokes aside, which workstation is your favorite? 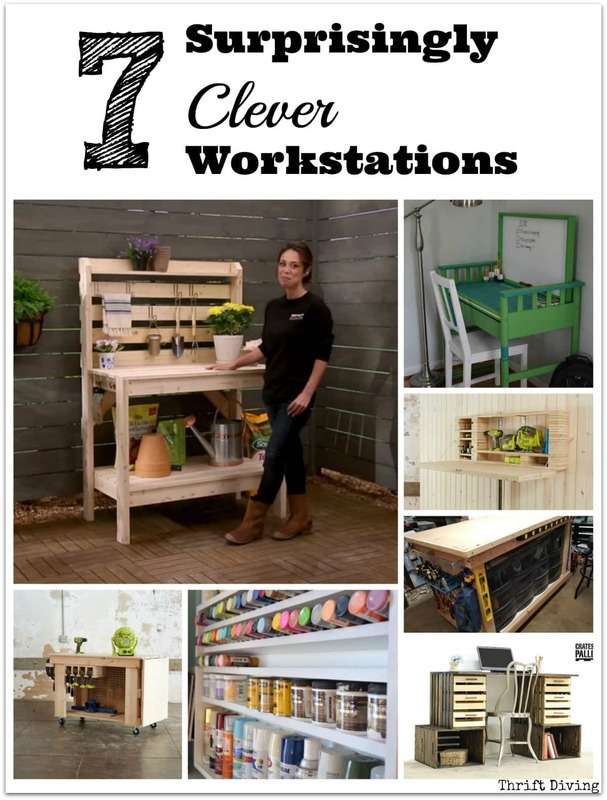 Create Your OWN Clever Workstation & Win! Got an idea of a creative workstation?? 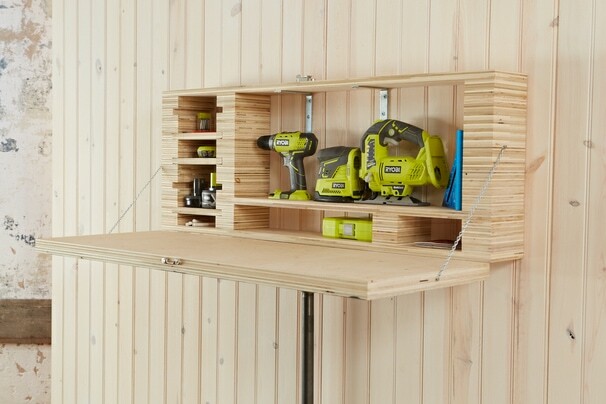 Go create it and then head over to RYOBI Nation’s “Project: Workstation Project Challenge” to win one of two $1,000 prize packs full of RYOBI power tools! Doesn’t matter what kind of workstation–anything creative that will help you get organized AND spark your creativity, whether it’s for crafting, building, or a workspace for homework! Head over to RYOBI Nation now, create a free account if you don’t already have one, and be inspired! Want to save this for later? Click here to PIN IT! I was excited to see the garden work station. My husband and I were cleaning our storage shed and he had thrown away a shelf . Of course, I retrieved it when he wasn’t looking. I was so happy to see my reclaimed shelf used to house my bags of garden soil, extra flower pots and garden tools!!! Some great ideas here! I am really liking the garden work station. I’ll be mulling that over. I only have a small deck, so I need to use the space to best advantage and one of my “this year” goals is to find a chest freezer for it. It’s the only possible place for one. I’m a little wary about the idea, although I’ve been assured that others have had no problems with one outside. But I super, super, want freezer space! I also want to do some container gardening. That leaves two “wall” spaces to accommodate a garden station. I’ll have to do some thinking about what might work best, but this idea would be a good starting place! And I’m voting for you! You have great stage presence and your video was the easiest to hear and follow. Because I have around 50% hearing loss it’s important to me that people not only speak loud enough, but clearly. You won that part hands down! Yea, for Serena! I hope you can find a freezer. Do you check craigslist? I think you can even set up alerts for those things! Hi Serena, I like all of them but especially the out door garden . Spring is around the corner I am excited to start building one myself. I like your cool project because you actually upcycled something into something else. All of the projects serve a purpose but I think it means more when we can utilize something with a previous life and save it from a land fill. You have such talent ? Awww…thanks, Janice! It’s a lot of fun thinking about upcycling stuff, too. I mean, just thinking of new ideas and then seeing if you can achieve them–how cool is that?? Upcycles are my favorite kind of project because it’s flexing that creativity muscle! I like to think that being creative keeps us mentally young. Hmm…maybe even warns off dementia, too, hopefully?? I like the build around workstation. I like the idea of all that storage! Cindi, I know!! Isn’t that super smart?? This would even make a really cool crafting desk, like putting 1 or 2 plastic storage things on each side, and adding some wood to build it in, but leaving the center open for a chair! 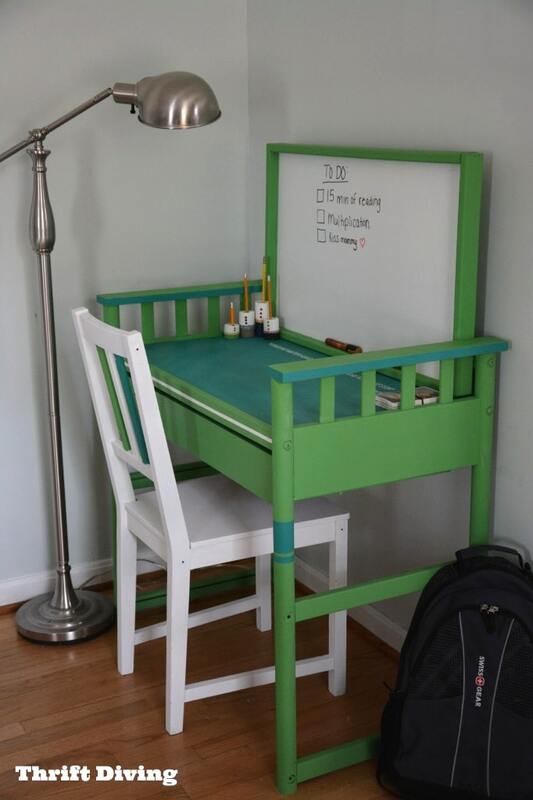 I like your changing table that changed into a table/desk! That is as neat as a pin! -and that you figured out how to make it! I checked out the Ryobi Nation site and saw you!! Wow, that’s even more neat! How did they know you would be such a pretty DIYer? Great ideas! Currently we don’t have a pool table, but I would like one for the kids to use. It would be so great to have some type of folding top to fit over one so you would have a really big surface for cutting fabric or other big projects that otherwise get relegated to the middle of the living room floor with all the dog hair. Maybe you could design one because you are very clever! We are building the potting station and planter boxes. I can’t wait. I think I could and would use the “all terrain” work station best. I like the pegboard for the tools a large cutting surface, and it’s moveable. Barbara, I like that one, too! I have been using two sawhorses with some thick foam over them, but it’s not big enough. I need something like this large one to spread stuff out, you know? The pegboard–SWOON! Love that! !